Harvesting the free solar heated air in your attic or conservatory using our automatic solar space heating system to heat your home instead of using your current heating system, is 10 to more than 100 times better for you, your wallet, and for our planet. Home heating system efficiency is 10 to 100+ times greater than all other systems, the heat produced costs 10 to 100+ less. In the south of the UK our solar heat harvester systems supply most solar heating in the spring and autumn, in the north it is provided in late spring, summer, and early autumn. The payback time of of your initial investment in our Attic and Conservatory Solar Space Heating systems is shorter than all other heating systems because the investment required is a small and the heat produced is extremely cheap. The biggest factor in solar space heating system payback time is the cost that you are currently paying for each unit of heat i.e. per kWh. 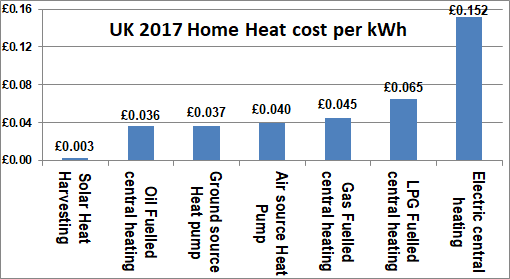 The following chart, based on data provided by Which.co.uk, shows the UK 2017 average heat cost per kWh of common UK home heating systems, the operating cost of Attic and Conservatory Solar Space Heating systems is included. IV. how much heat your Solar Space Heating system provides. I. Typical costs for the parts required to install an attic solar space heating system components is around £500. Installation is generally quite simple and straightforward, installation instructions are included on this website. Installation costs depend on how difficult it is to fit the system to your home, this will depend on how many floors the insulated ducting has to pass through, and the associated difficulty and of completing the task in a neat way. Cost can range upwards from some £200. Typical costs for the parts required to install a conservatory solar space heating system components is around £250. Installation is quite simple and straightforward, installation instructions are included on this website. Installation costs depend on how difficult it is to fit the system to your home, generally the process is relatively simple and involves making two 200 to 300mm air holes between your conservatory and your home, one high for the hot air entry, and one low for the cool air return. Fitting the Attic Solar Space Heating controller and the associated system wiring is a straightforward process. Cost should be around a few hundred pounds. II. and III. 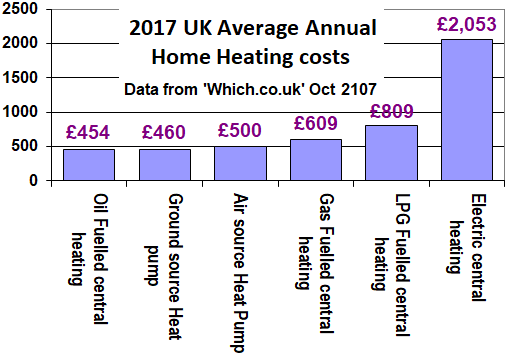 2017 Home Heating cost, according to Which.co.uk, for an average semi detached 3 bedroom home are show in the following chart. This chart also shows the large cost variation between different types of home heating. IV. The amount of solar heat you collect will depend greatly on the location, orientation, and characteristics of your home. 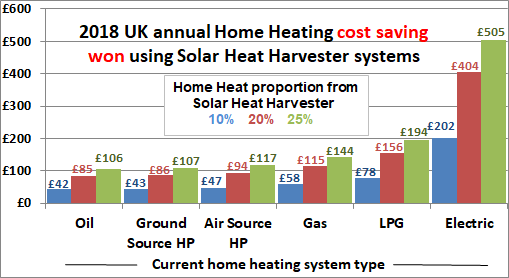 The following chart shows the annual savings gained in an average 3 bedroom semi-detached home for the most common UK home heating systems for three different amounts of annual Solar Heat energy provided, 10&percnt;, 20&percnt; and 25&percnt;, the savings in larger homes will be greater. The Attic Solar Space Heating parts required to fit a system to your home typically cost from £250 to £500, the installation process is quite simple and straightforward, fitting instructions are supplied. Attic and Conservatory Solar Space Heating systems are very reliable and generally no annual maintenance is required. Where can SSH be used? Solar Heat Harvester is a revolutionary environmentaly aware, green energy company based in Cornwall, UK.